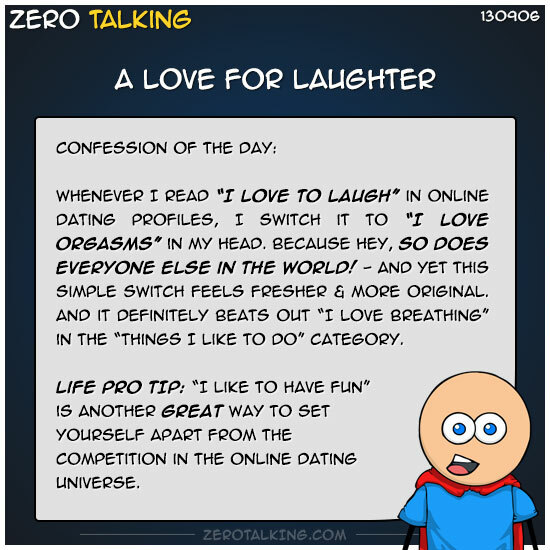 Whenever I read “I love to laugh” in online dating profiles, I switch it to “I love orgasms” in my head. Because hey, so does everyone else in the world! — And yet this simple switch feels fresher & more original. And it definitely beats out “I love breathing” in the “Things I like to do” category. Life pro tip: “I love to have fun” is another great way to set yourself apart from the competition in the online dating universe.